Enjoy the beautiful Pocono Mountains' 2,400 square miles of the outdoors in any season. The Appalachian Trail marks the southern border of the Poconos, and many other trail systems offer waterfalls, spectacular viewing condition and a high concentration of rare plants and animals. Hiking trails in state parks lead to beautiful vistas and waterfalls, or by wetlands bubbling with life or through dark, old growth forests and to uncountable adventures and chances to see wildlife. Some trails are scenic or leisurely, while others are self-guiding, educational or rigorous exercise. Be sure to visit our national, state and local parks for even more opportunities to hike different parts of the Pocono Mountains region. Explore the natural beauty of the Pocono Mountains! Enjoy these videos and learn more about hiking! Highlights: It&apos;s only a short distance to view the Main Falls ​from the primary observation deck. 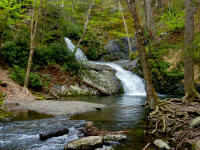 Three additional hiking trails provide numerous viewing angles of all eight waterfalls. Highlights: The Kettle Creek Wildlife Sanctuary itself is a 166 acre preserve. Over 2 1/2 miles of maintained and well marked trails are open for public use year-round, 7 days a week. The trail system at Kettle Creek is relatively easy to follow with the aid of a map or simply by following the signs. Highlights: Hiking Trails are available every day year-round. PEEC offers six trails that vary in distance and difficulty. All trails are loops that begin and end on the PEEC Campus. 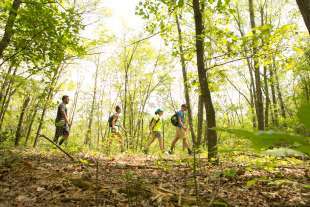 Highlights: There are approximately 50 miles of hiking trails in Promised Land State Park and the surrounding Delaware State Forest. Splendid opportunities exist for nature study, relaxation, and exploration.